DJI-Pilot.2.9.1.apk .... supposed to work on Windows phones ? I have been trying to find DJI Go way to run on Windows phones ... I think it restrictive to just have Android and IOS when there are a lot of Blackberry and Win Phones out there. So has anyone had any success with this apk ? When you look through sites to find suitable tablets etc. in the 5 - 9" size, my choice is a 7" ... you see far more WinCE versions than any others and they tend to be lower priced as well. So why not ? DJI does not make an app for Windows. 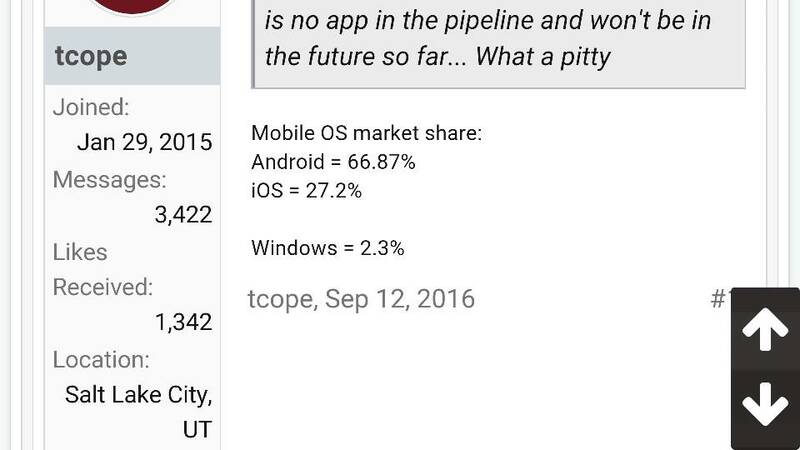 a .apk app is an Android app, not a Windows app. Windows has about .4 - 1% of the market share. Companies simply are not going to spend the time, money and resources to support 1%. So no, there are not a lot of Windows phones and Blackberry phones out there (BB is at less than 1%). I am well aware that apk indicates an android app ... but this one says Windows capable. And I fully realise it is not DJI's. Whether people like it or not - with MS taking over Nokia - along with an increasing number of GPS enabled tablets installing WinCE ... the market is changing. Android has basically shot itself in the foot with its 3rd party upgrading - how many Android devices do you know of that cannot upgrade the version ? Why not ? Because Android for years now has not been controlled by its originators. I have a number of Android units that are basically useless now for that very reason. Look at the car Navigation arena ... WinCE is taking an ever larger market share on that and will continue to increase. Why do TomTom ... iGo .... along with others produce WinCE versions if its not worth their while ? Sorry the argument against is a short term affair and will soon prove unnecessary. I am not a Pro WinCE person in fact - but ask because I see the writing on the wall. Microsoft will push the Smartphone / Tablet markets hard as it does in all other units. Like every company - including mine - always looking to expand market share. Burying head in the sand will not cure this. Lol, sounds to me like your preparing for a storm that's not going to hit for years yet. Save yourself from all these headaches and just get a iOS or Android for now. As windows market increases, dji will adapt accordingly! I used to have a windows phone. Two in fact. I was waiting for app support. It never came. Got android. That's my poem for the day. It technically can be controlled in Windows. You'd have to install Android SDK on your PC then run it through the emulator. Edit: I read Windows not Windows phone. So to expand upon my answer; set up a VNC server on your PC then SSH into it from your Windows phone. Anyways, as you can see, what you are asking is definitely possible. If it's worthwhile to go through all this trouble is up to you. The P3 uses a version of unix, the RC uses a version of unix, android is a version of unix and the apple os is a version of unix..........why try to add microshite into the equation? The OP will need a bigger mount on the controller to mount the PC and monitor. Windows Mobile and Windows CE are really two different things. However, this does not change the fact.. DJI's Go app won't run on Windows Mobile. There is no indication that DJI will ever support this. You can not like it, it can be wrong, etc.... none of that will change these facts. We have enough issues with the GO app on the supported devices. Wanting to fiddle around with a ported app because you have a preference for an unsupported platform is likely to prove more trouble than it is worth.